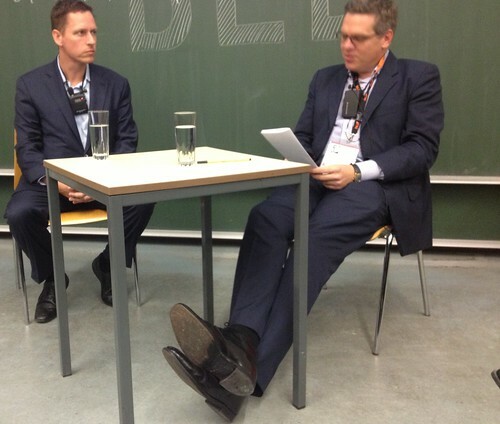 Tonight's highlight was the public lecture with Peter Thiel at the Ludwig-Maximilians-University Munich. 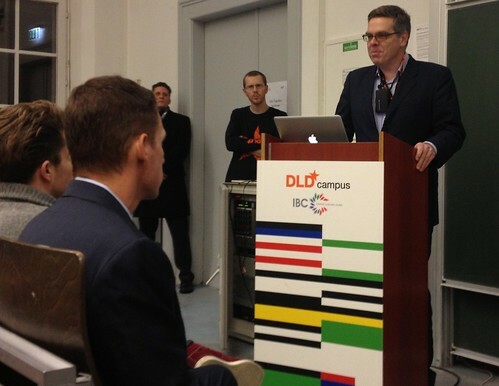 Stefan Winners, Hubert Burda Media Holding moderated the DLD campus lecture and introduced Peter Thiel to the audience. Stefan Winners is looking for young and talented people working for Burda digital. If you think you have "entrepreneurial" behaviour he's hiring! 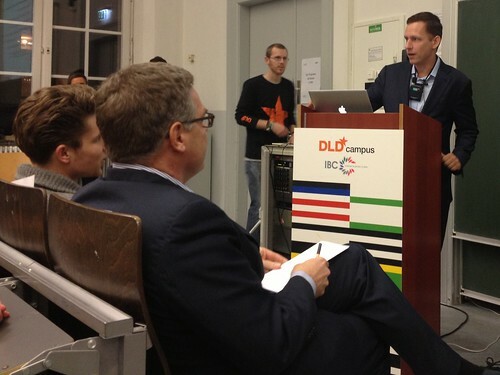 Peter Thiel, German-born American entrepreneuer, VC, and hedge fund manager, gave an inspiring talk. Always looking for new ideas and businesses with sustainable value, he told his own story of co-founding PayPal in 1998 and being the first extern investor of Facebook in 2004. Especially the story about a business meeting with Mark Zuckerberg and Yahoo employees draws a chuckle. Mark Zuckerberg didn't want to sell Facebook, not even for the amount of 1 bn $. He had the spirit to think with a long-term strategy, he didn't thought about the money, he didn't wanted the money. His vision was the evolution of Facebook. Future great tech businesses will be unique in an own category and not just better versions of google, facebook, and all the other existing companies. There will be no local technology, it's all global. Founders: you have to be the best in the world and have a sense what everyone else is doing. To find such great tech businesses Peter Thiel takes his time for support only a few businesses. "We only want to invest into companies we are 100% sure will succeed." Because: "Nobody should be treated as a lottery ticket"
Silicon Valley start-ups are usually more successful than German ones. Peter Thiel gave us an idea why. Usually German CEOs are business managers, but successful start-ups from the US are runed by their founders. "I think it is important for the CEO to be a founder, because they have the compassion to build businesses." How to become a successful start-up? Ask yourself what is the reason your 20th employee should work for you and not for Google or Facebook. He/she would earn more money working for a big player, so why should this employee work for your business? This might be the key to your successful business.